... this is what an actual "Bowman's Best" card looks like. This is the Bowman's Best we remember, and the Bowman's Best we all like to see come back. I get it. You're a monopoly, and like all monopolies, you cut corners whenever you can. What else are we going to collect? The chintzy foil-board may cost less, but it just doesn't compare to the original. HA! I knew they'd eff up the only thing that looked halfway decent in this set. Too bad that's not what a "real baseball player" looks like. 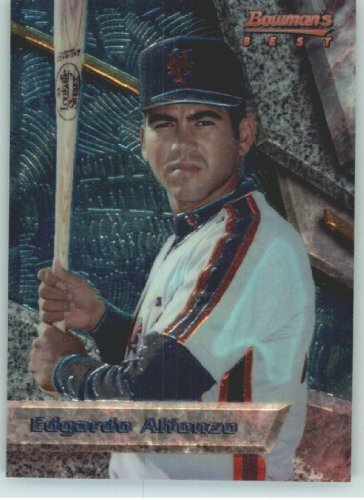 That's Edgardo Alfonzo, the hardest working 15-homer man in the business, at least for a few years.